Formulated with the highest quality ingredients combined with two tanning agents to give an even, long lasting tan from head to toe. Easy application and fast drying. Continuous spray works at any angle to tan hard to reach areas. Beyond Bronze by Fake Bake Flawless Self-Tan Liquid is applied in effortless, gliding strokes for a perfectly even tan. All orders must be paid for before dispatch. When applying fake tan product apply skin smoothie to dry areas of the body to help smooth over these harder to tan areas. Can also be used for added hydration if applied over the entire body after showering. Fake Bake Bronzer Instant Wash Off Tan Lotion is a simple way to create an instant golden bronze for all complexions, and is exceptionally good for covering irregular skin tones. The guide colour can be washed off after 1 hour for a golden tan, 2 hours for a bronze tan and 3 hours for a dark tan. Fake Bake Flawless Self Tan Travel Survival Kit. Fake Bake tan enhancing lotion 170ml. This special formula has been created to enhance and maintain your fake bake tan. Also can be used to enhance your natural colour. Intending to lengthen the life of your tan. Fake Bake Tan Enhancing Lotion 170ml. New & unopened bottle Purchased from Boots but never used. With Gold Glisteners Fake Bake Tan Enhancing Lotion is a special formula composed to enhance either a Fake Bake or natural tan, lengthening your tan and conditioning your skin for a gorgeous year-round glow. Rich essential emollients quickly penetrate your skin to replenish moisture and give your skin a softer and smoother feel. The gold glisteners in the formula give it a rich shimmering effect. Launched in 2014, Fake Bake The Face self tan lotion, combines the highest quality self tan ingredients, with clinical levels of Matrixyl-3000 from Sederma to benefit your skin, reverse anti ageing process and reduce the appearance of wrinkles. Size: 210ml (7Fl Oz). Fast drying and easy to apply, this super-light mousse showcases our incredible technology combining special ingredients to promote deeper penetration resulting in a deeper and longer-lasting tan. Fake Bake Beyond Bronze Instant Wash Off Premium Tan Face & Body 2x125ml Sealed. Condition is New. Dispatched with Royal Mail 1st Class. Fake Bake Beyond Bronze Instant Wash Off Premium Tan gives a beautiful natural tanned look in an instant. Short of time, or just topping up your existing tan. Fake Bake Body Bronze Instant Wash Off Premium Tan is moisturising and transfer resistant and washes off easily. Suitable for face and body. This non-sticky lotion won't clog pores either and it’s exceptionally good for smoothing out irregular skin tones. MAXIMUM ORDER QTY - 10 PCS. MAXIMUM ORDER QTY - 5 PCS. Brand New Fake Bake Lipo Bronze Self-Tan with Anti-Cellulite 133ml. Box is damaged, please see photographs outlining damage. Product inside is not affected. Buy now for bargain price of £13.99. Free P&P. 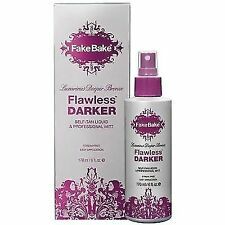 Beyond Bronze By Fake Bake Flawless Self Tan Liquid Spray Spritzer 148ml. 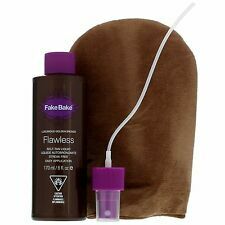 Beyond Bronze by Fake Bake Flawless Self Tan Liquid is applied in effortless, gliding strokes for a perfectly even tan. Fake Bake Beyond Bronze Flawless Self Tan includes application gloves & mitt. Fake Bake Oil Free Mistifier Body Spray leaves the skin silky smooth and hydrated with a radiant sheen. Fake Bake Platinum Bamboo Buffing Face Polish Exfoliator. Fake Bake Platinum Face Polish Gentle Exfoliator is 60ml. Premium levels of Botanicals hydrate skin for greater absorption of DHA and Erythrulose. NEW Fake Bake Beyond Bronze Airbrush Self-Tanner 210ml Self Fake Tan Spray. Showcasing premium botanicals and a specialist Peptide formula, Fake Bake Beyond Bronze The Face self tanning lotion ensures you are a bronzed babe and fresh faced all at once. This beauty & bronzing hybrid combines the highest quality self tan ingredients, with clinical levels of Matrixyl-3000 from Sederma to reverse the ageing process and reduce the appearance of wrinkles. Long for a natural, long lasting, streak-free tan?. Look no longer! Apply small amounts of the lotion in circular motions on the skin using the free application gloves! Leave to develop for 4 - 6 hours (or longer for a deeper tan) and rinse off for the perfect golden colour! This non-sticky lotion won't clog pores either and it’s exceptionally good for smoothing out irregular skin tones. Fake Bake Beyond Bronze Airbrush Self-Tanner is the easiest way to achieve a tan. Contains only the finest naturally derived, premium tanning agents DHA and Erythulose for a longer lasting, natural looking tan. Fake Bake Beyond Bronze Self Tanning Mousse 210ml for Her, NEW SEALED. • SOAP-FREE Gin-U-Wine Body Polish has been formulated to improve the absorption and efficiency of the Beyond Bronze tanning products while leaving the skin smooth, polished and hydrated. Trading online since 2008. This luxurious lotion uses only the finest naturally derived ingredients, providing a light, non-sticky coating to the skin which doesn’t clog pores. For the ultimate one night only tan, that even Cinderella would be jealous of, this Matte Light Lotion is perfect for Beyond Bronze Babes with fair skin or for those looking for a light radiant glow and gorgeous Matte finish. Contains Application Gloves & Mitt. 1 Hour - A Beautiful Golden Tan. 2 Hour - A Bronzed Tan. Get a premium tan with Beyond Bronze by Fake Bake. Instantly gives you a brilliant natural tan. SUN PROTECTION. View our Piz Buin range. View our SunSense range. View our Garnier Ambre Solaire range. Fake Bake oil free mistifier 120ml. a significant spray for superb soft skin . Fake Bake Beyond Bronze Wash Off Tan Shimmer Light 125ml for Her, NEW. Fake Bake Sport Unisex Daily Gradual Tan. When your weekly cardio involves more that just tanning, Fake Bake Sport daily gradual tan is the product for you. Fake Bake Sport Daily Gradual Tan is lightweight, non-greasy formula that dries quickly and invisibly on the skin and does not clog pores. The essential first step to applying a flawless facial self tan. effectively exfoliate more delicate facial skin removing impurities. FB tanland. Self-tanner designed specifically for the face. Utilizes cell renewal and apple stem cells to promote repair and rejuvenation of the skin. Fake Bake Bronzer Instant Tan Lotion Wash-Off 125ml. The Luxurious Matt Finish Is Great For Smoothing Out Irregular Skin Tones. Simply Washes Off With Soap & Water. A Golden Faux Glo Product. A Simple Way To Create An Instant Golden Bronze For All Complexions. Size: 148ml (5Fl Oz). Beyond Bronze by Fake Bake Flawless Self-Tan Liquid is applied in effortless, gliding strokes for a perfectly even tan. Includes application gloves, mitt. • Spray small amounts of liquid onto soft side of the mitt and apply in gliding strokes to the body. A gradual tan which you can apply daily to slowly build-up your tan colour so there is no sudden change in skin tone.